Medieval men would have been quite happy if medieval women didn't wear their skirts. Or their bodices. Or chemises. Or pretty much any part of their outfit. 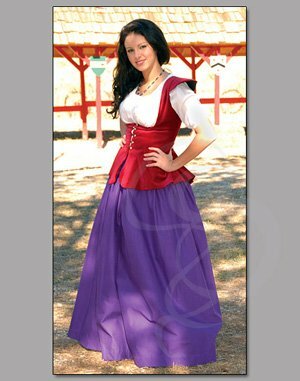 But Medieval men aside, skirts were an important part of a woman's outfit. These gathered skirts are light, airy and full of color. They are made from cotton in such a way that they mimic linen weave patterns (without the added expense of linen weave). They feature two rows of lacing on the back for a perfect adjustment every time, no matter what your size or shape (assuming you are not an Ethereal Quoatl, in which case you might have to roll the waist over itself a bit. And become ethereal. And maybe grow hips or something). The extra-high laced waistband is far better than elastic -- the lacing ensures a much better fit and keeps your chemise and bodice tucked in nicely all day. You'll never look disheveled with these skirts (unless you're actually going for a disheveled wench look, in which case I'm sure you'll manage). The lacing also allows you to alter the size of the waist in case you lose weight (or gain weight). Available in Obsidian, True Red, Kelly Green, Eggplant, Crimson, Curry, Ocean Blue and Berry.